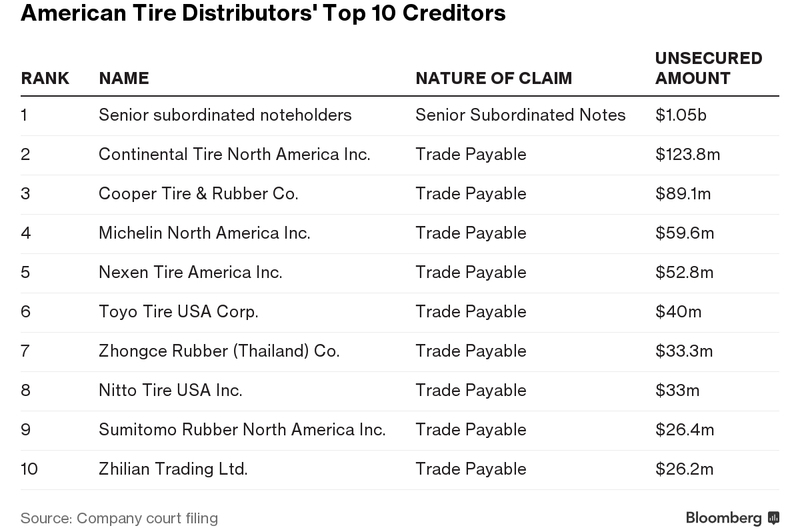 American Tire Distributors Inc., buffeted by the defection of two big manufacturers, is filing for Chapter 11 bankruptcy in Delaware after reaching a deal with most of its bondholders to reduce its debt by about $1.1 billion. About 75% of the company’s bondholders agreed to a plan that would give that class of creditors a 95% equity stake, American Tire said in a statement. The deal gives the firm continued access to the company’s revolving credit facility, plus $250 million in new financing, American Tire said. The company, owned by TPG Capital and Ares Management LP, had previously disclosed debts totaling more than $2.3 billion. A Chapter 11 filing typically allows a business to keep operating while it devises a turnaround and a plan to pay creditors. The company’s National Tire Distributors and other Canadian subsidiaries aren’t part of the court-supervised process, CEO Stuart Schuette said in a letter to employees. “We are open for business and taking care of our customers and supporting them across all channels, as well as the consumers they serve,” Schuette wrote. “Looking ahead, we intend to move through this process as quickly as possible.” He called the filing “a positive, intentional and strategic next step” that will ultimately strengthen the company’s financial position. Smaller sums were owed to Goodyear and Bridgestone. American Tire says it’s one of the biggest independent sellers of replacement tires, with more than 140 distribution centers in the U.S. and Canada and about 5,000 employees. The company, based in Huntersville, N.C., was thrown into disarray earlier this year when the makers of Goodyear and Bridgestone tires decided to deal directly with consumers through their own networks. Another blow came when Sears auto centers agreed to install tires bought on Amazon.com. American Tire tried to fill the gap with tires made by Cooper, Continental and Michelin, but the financial pressure became so intense that the company skipped an interest payment on some bonds in early September. Operations and sales will continue normally as it goes through the bankruptcy process, with manufacturers and vendors paid in full for existing bills assuming the court approves, the company said. The plan calls for the existing equity owners to keep a 5% stake. Kirkland & Ellis is serving as legal counsel, AlixPartners LLP is serving as operational adviser and Moelis & Co. is providing financial advice, the company said.